Right across France's Rhone River from Chateauneuf-du-Pape is the commune of Tavel. All the wine that bares its name is rosé. And rosé is the ultimate wine of spring. Domaine de Chantepierre has remained in the same family for 500 years and all of their wines revolve around southern Rhone Valley's beloved Grenache grape. 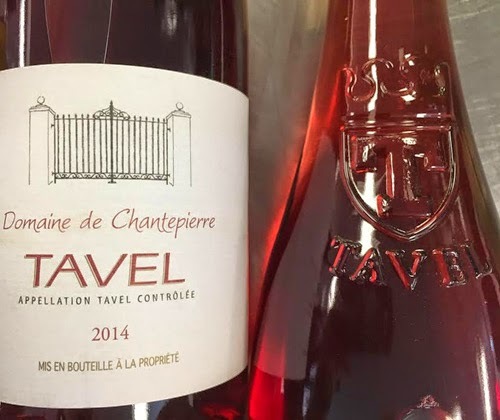 This Tavel uses 50% Grenache with other red grapes Syrah, Cinsault, Carignan, and white grapes Clairette, Picpoul and Bourboulenc. It also features the three soil types of Tavel. This one might be a little darker in color for a rosé than you're used to, and have more in common with a white than you would think. The nose has a beautifully rocky minerality with clementines, peach and raspberry. It has a big body with a palate of lime, kiwi and watermelon. It's so juicy I can't even stand it. You know those strawberry-goo filled strawberry hard candies with the wrapper that looks like a strawberry? That's how this rosé finishes. Just like that, but with a touch of cilantro. Rating: 4/5 = Recommended / Highly Recommended. The bottle used was supplied free of charge by Wine Adventures for the purpose of this unpaid review. To have your wine reviewed follow this link.